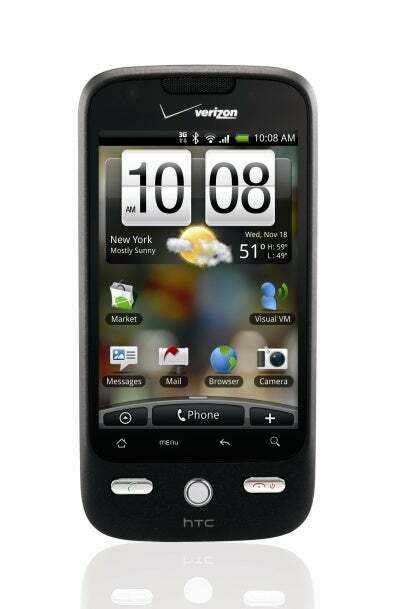 Does the latest Android phone on Verizon, the Droid Eris, seem familiar? Not only does it have an almost identical name to that other Verizon Android phone, but it looks an awful lot like the HTC Hero, which debuted in the US on the Sprint Network. The HTC Droid Eris will be available alongside the Motorola Droid on Friday, November 6 in Verizon stores. The HTC Droid Eris is a solid alternative to the Motorola Droid for a few reasons. First, the Droid Eris will cost $100 with a two-year contract, making it the most affordable Android phone currently available--and half the price of the Droid. Second, the Droid Eris runs HTC's slick Sense user interface overlay, which is a lot more aesthetically appealing than the somewhat sterile Android 2.0 (also known as Éclair) user interface. Lastly, the Droid Eris is lighter, and more pocketable than the Droid. In my brief hands-on time with the Droid Eris, I found that it felt very comfortable in hand due to its curved, rubberized backing. In the specs department, the Motorola Droid trumps the Droid Eris. The Droid Eris has no keyboard, a smaller lower resolution display (3.2-inches as opposed to the Droid's mammoth 3.7-inch display), and a less-powerful processor. The Droid Eris also ships with Android OS 1.5 so it is missing all of the Android 2.0 goodies found on the Motorola Droid, like Google Navigation and a universal inbox. The Droid Eris still has a respectable array of specs and features. Like the Motorola Droid, the Droid Eris has a 5-megapixel camera with video recording and uploading capabilities and the Droid Eris' browser supports Flash Lite (though we had some issues loading some Flash content on the Hero). HTC also told us that they plan on bringing Android 2.0 to both the Hero and the Droid Eris, but they still have to work out some issues with running Sense UI with the update. So if Android 2.0 is the biggest draw of the Motorola Droid for you, you still should consider the Droid Eris-you'll just have to wait a little longer for that Éclair goodness. With the buzz the Motorola Droid has been getting, the Droid Eris may easily be overlooked. If you plan on hitting your local Verizon store early tomorrow to pick up the Droid, don't ignore the Droid Eris. It might fit your needs better than the Droid--and you'll spend less than you planned.